Is It Cowl Season Yet? I have started making some cowls for gifts. And for myself. I love the look of a scarf, but cowls are very practical. They never come undone. And they knit up quickly. This is one I started because I love the look of feather and fan stitch. It's one of my all-time favorite stitches. (You cannot beat this stitch for an elegant-looking baby blanket, folks.) It's an easy pattern to memorize and it goes super quick. This cowl pattern is knit flat, with the cast on left live. Then the live ends are joined using kitchener stitch. The only thing I really don't like about this problem is the provisional cast on. I really hate provisional cast on. In fact, I thought about not doing it and just seaming the cast on and cast off with something like mattress stich. Or just a regular ol' whip stitch. But, I decided the seamless look of the provisional cast on married with the kitchener stich would be worth the effort. So I had to YouTube provisional cast on. 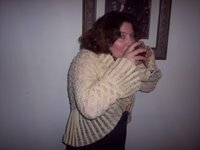 Once I was knitting, all was ok. Like I said, this pattern goes fast. I knit this is about two nights' of TV watching, but it could've gone quicker if I'd been a little more attentive to it. Not sure exactly what this yarn is, btw. It's some wrapperless yarn I got from Michael's a while back. The problem is picking up those live cast on stitches and putting them back on a needle. I almost wish I'd just cast them onto a circular needle and just let that needle hang there while I knit. So hard to see where the stitches are, especially when you have a pattern like feather and fan, which slant the stitches (decreasing and increasing) and creates holes with the yarnovers. It took a long time to pick up these stitches. And when I was done, I was too irritated to fiddle with kitchener stitch. Maybe later. I got a call from my brother this weekend, and it occured to me that I hadn't talked with him since he visited last month. Worse than that, I don't think I've talked to my other brother in about 7 months. How did that happen? I mean, I've been busy and I know they've been busy, but seriously? How do you go that long without talking to a sibling? I think I must be the worst sister in the world. But it was also fun to compare things that we knew about our childhood, our family, and the town we grew up in. He's younger than I am so some of the things I remember, he doesn't, or he didn't understand at the time. But, I left the town at 17, and he has lived there all his life, so he has more day-to-day contact with the people we've known. I think I will definitely try to carve out some time to at least call my older bro. I do miss him, even if I haven't shown it by my lack of contact. Someday I will move from this horrible house and my new house will have a kitchen I like. And I will decorate that kitchen tastefully--with the exception of a few randomly placed roosters. I just like looking at them. It's wordplay. I'll give you a second to catch up. Got it? Haha. Yes. I'm a dirty old woman. Anyway, M shares that joke with me and will often send me pictures of ceramic roosters or fake feathered roosters, or what have you. So I made this Christmas ornament for her. It's Barnyard Birds by Kristen Wyszynski and made from some white Vanna's Choice and some random red, orange, and yellow. I used worsted instead of the sport weight it called for because I'm trying to keep all these ornaments about the same size. And because I had worsted. I found out about this craft fair yesterday. Bre was working at her mom's booth. So R, M, and I all decided to go so we could harass visit Bre. Besides, you know I loves me some craft fair. Sadly, this fair did not really live up to expectatations. As you can see, it's an outdoor fair. And I'm pretty much strictly an indoor cat. I know this sounds terrible, but being out in the the sun and heat and flying insects just doesn't really put me in a festival mood. Plus, with my random hot flashes (thanks for that, by the way, Mother Nature) I'd much prefer an air conditioned high school as a venue. Needless to say, my poor deoderant lasted about 20 minutes. Sorry about that to all who had to be in the car with me on the way home. Plus, this was more of a fair than a craft fair. There were maybe a dozen craft booths. And probably about 20 political booths--all for school board seats. Apparently school board is the hot election in this area. And the big attraction here was the Pet Adoption. There were several dogs and a couple of kittens that were up for adoption during this fair. They had a special Pet Parade, in which they told the terrible stories of how these poor animals were abused before coming to this shelter. The Pet Parade presentation was, of course, marred by my wracking sobs. R and Bre ended up applying for adpotion of a very sweet Great Dane puppy. I consider it a victory that I didn't come home with cats and dogs, myself. But, you know, I am at that age where I have to be careful. I'm dangerously close to Crazy Cat Lady status already. Did I mention my out of control hormones? First of all, I should apologize for being away so long. To you, my dear readers, because I have been away for so long with no word at all. And to myself, because I so love writing this blog. Overworked. For sure. People think it's such a cakewalk to own your own business, like you could come and go as you please. Like you just sit there and let the money roll in. (What??? I wish.) But I work longer and harder now than I ever have. And for less thanks, too. Let me tell you. But, it definitely is more rewarding. And I definitely do love it more than any other job. But I have long forgotten the meaning of the phrase "day off." Stressed. After Gabby's death, almost immediately after, GenGen just started falling down. Like she couldn't hold herself up. And wouldn't eat or drink. I really thought that was the end of my poor old dog. It turns out, she just had vertigo. And it's gotten mostly better (although she still sometimes wobbles) but she lost like 5 pounds. That's a lot for a 40 pound dog. So I've been trying to fatten her up. Eggs. Peanut butter. (She's milking this for all it's worth, I think.) Oh, but now she's started licking all her fur off. With her wobbly gait, patchy fur, and skinny frame, she looks like a hobo dog. I'm pretty sure one of my neighbors is going to see her and file some sort of animal rights claim on me. And I didn't get invited to my niece's wedding or my other niece's birthday, so I'm thinking "That's what you get for not having any time for anybody, Patwoman!" Sleepless. Another round of insomnia/sleepwalking/dreams. I've just done that since I was a child. Not a big deal, but I'm losing my beauty sleep. And, if I'm honest, a little Depressed. I really miss my GabGab. I know that's strange to say about a cat, but it's true. Her death has affected me so deeply that I still sometimes cry and squeeze Achilles and Miss Gracie a little too tightly. I miss her especially while I am knitting, since she was my constant companion when I had the needles in hand. Frankly, I'd all but stopped knitting for a while because I was so busy. But then I just felt like I needed to do it, for others' safety my own sanity. So I am knitting some these days. And I'd like to do a little writing too. But that may be just too much to ask.